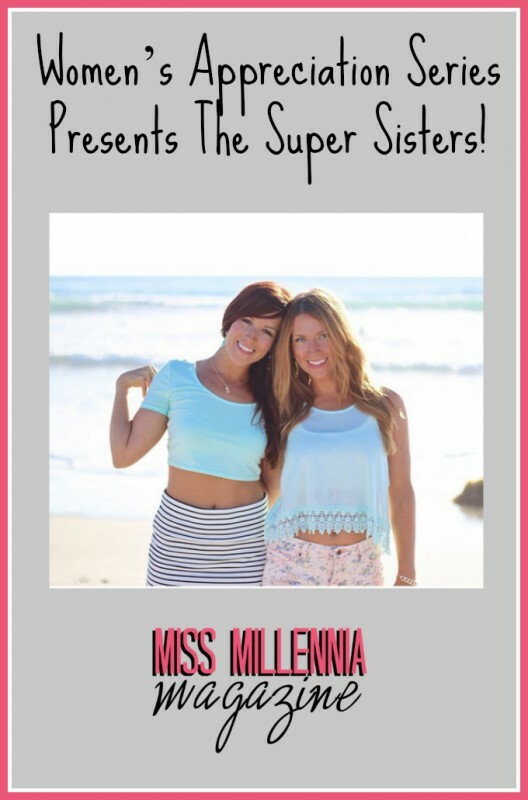 Women's Appreciation Series Presents The Super Sisters! Women’s Appreciation Series Presents The Super Sisters! Meet the Super Sisters! Liz and Sara, runners of GoSupersisters.com are not your average personal trainers. Struggling with weight and unhealthy living throughout their younger lives, Liz and Sara have dedicated themselves to the fit life and helping others realize their potential in fitness and healthy living. The girls’ website features not only awesome home workouts that get your heart pumping, but Liz and Sara have also written a series of healthy eating Ebooks full of enticing recipes that the Sisters created themselves. Residing in sunny Santa Monica, California, Liz and Sara currently work as group fitness instructors and personal trainers. How did you ladies come up with the name ‘The Super Sisters’? When we first started our blog in 2012 we sat down to film a video one day and decided we needed a name for ourselves. Everyone already knew us as “the sisters” (even random strangers at Bed Bath & Beyond would comment on it) but we also wanted a name that encompassed all aspects of a healthy living lifestyle, a name that implied we were sort of like the “Martha Stewarts” of fitness. The term “Super” represents a perspective that incorporates all assets of healthy living — food, fitness, and fun — we do it all. I know I fight with my siblings, does it get difficult working together as sisters? When we were living together, we had one or two days where we wanted to punch each other in the face. So yes. But at the end of the day we love each other very much. We’re usually laughing in about 20 minutes after an argument. What was the turning point in your lives that inspired you to delve into the fitness world? We have seen our dad almost die a few times. Poor diet choices and very little exercise made him pretty unhealthy. He had a life-threatening heart attack when we were very young and has since had more heart surgeries than we can count. The turning point came after watching him suddenly become paralyzed from the waist down due to complications caused by a postponed spinal surgery meant to correct a slipped vertebral disc. He couldn’t walk for almost 2 years. It put a lot of emotional stress on our entire family and we decided we did not want a similar fate. This meant in order to prevent any future health problems we had to start now. How did you come up with the idea for GoSuperSisters.com? We had seen other amazing blogs out there that did things similar to what we already were doing in our day-to-day lives, for both ourselves and for our personal training clients (our slogan has always been “Making Fitness Fun” and everything we do follows that goal). It was only a matter of time before we sat down to figure out how to share our recipes and workout programs with a wider audience for an affordable price, or in most cases, for free. We love helping people and it was the easiest way to reach people who wanted help. Some of the biggest early influences were Dashing Dish and Chocolate Covered Katie and they both inspired us to make our creations public for others to enjoy in the same way we enjoyed theirs. Where did you learn all the healthy cooking and baking secrets? We are both self taught in the kitchen and like to keep things simple yet tasty. Our “secrets” are discovered 100% through trial and error and lots of time spent in the kitchen. What was the most difficult part about writing your Ebooks? For the first ebook, we had no idea what to do. It took FOREVER to design. We set a public deadline of February 14 (Valentine’s Day) for that book, and even though we had been working on it for months, we still spent the entire week before working crazy 12+ hour days trying to finish it all. What is each of your favorite recipes that you feature in your Ebooks? Hands down the best recipe in our ebooks is the Chocolate Hazelnut Butter in the desserts book. We had a lot extra after taking pictures for the book so we ended up giving most of it away to friends and coworkers. It was polished off within seconds of dropping it off at the physical therapy clinic that Liz worked at, and some of her coworkers even got into a fight over “who ate the last of it.” They requested more for weeks after that. What does the future hold for the Super Sisters? Who knows! We know no matter what, we will always be best friends. We’d love to continue doing what we’re doing but on a wider scale. We will continue to create and publish healthy alternative recipes and ebooks. As certified personal trainers, we will also continue to create workout programs for women who desire to make the same changes we did. We’d love to make a workout DVD at some point (so people can experience what it’s like to take a class from us) and we will continue to teach and train our private clients. Sara is getting more into yoga too, so that will be fun to incorporate! What piece of advice can you give to individuals struggling in the fitness world? This is a broad question, as we’re not sure whether this pertains to trying to make a career of fitness or just trying be healthier and happier in your own body. Either way, the answer is pretty much the same. First, you have to understand your top 3 underlying priorities. Why do you want to do what you’re trying to do? How will it enhance your life? What is your underlying motivator and does it match your top 3 priorities? Most people don’t take the time to understand why they’re doing what they’re doing so they never find true motivation to keep themselves going. If you know your life priorities, it will help guide all of your decisions and keep you on track. Next, you have to outline goals and write them down, giving each one a deadline for completion. If you don’t know what it is specifically that you want, you’ll never get it. Keep your goals very VERY specific. For example, instead of “I want to lose weight,” write down “I will lower my body fat percentage to 23% by January 1st.” Outlining specific goals like this allows you to say “Okay, so step 1 is to figure out what my body fat currently is,” and breaking it down like this enables you to know where you stand, where you want to be, and what small steps you need to take every day in order to reach your goals. Overall it’s about focusing daily on making small improvements or eliminating small manageable tasks from your “action step” to-do list. Learning to break down big goals that are in line with your priorities into step-by-step actions are what separate success and failure. Chisel away at it every day. Slow and steady always wins the race, and successful people know it. Visit Liz & Sara at GoSuperSisters.com & GoSuperSystem.com!